We’re very happy to announce that we are bringing KIDS into the Double Fine Family! KIDS is an experimental project about the psychology of the group, allowing players to move with and against crowds until everyone is gone. It’s the second collaboration from Playables; director and animator Michael Frei and game designer Mario von Rickenbach after their award-winning animated short film and short game Plug & Play. It’ll be out later this year for computers and mobile device things! View All Comments! - Leave A Comment! Would you like to join our Discord? Join the official Double Fine Action Discord server at discord.gg/doublefine and chat with us about all things Double Fine, and lots of other unrelated things too. The one thing we definitley will not be discussing however is the sixth moon of Jupiter, Europa. It’s nearly time for the Game Developers Conference here in San Francisco, and so also time for our GDC edition of Day of the Devs! This edition is much smaller than the real annual event, a showcase of 10-15 games embedded inside the Moscone Center. We also host a really fun and super casual showcase of the games at the Alamo Drafthouse movie theatre, an event that is open to anyone - no GDC badge required. Tickets for that will be going up soon - probably early next week, so keep your eyes peeled if you’d like to join us! Check out this 2 Player Productions trailer for the event to get a glimpse at some of games we’ve curated this year, the full lineup is below too! Harold Halibut from Slow Bros.
We were really intrigued by the new Discovery Tour Mode for the latest Assassin’s Creed title, and so have recorded a special episode of Devs Play to examine it. This new mode enables you to explore the beautifully crafted world of Assassin’s Creed: Origins free from the typical gameplay, instead allowing you to soar through the skies as an eagle to visit the in-game locations as a tourist, and see them in a new, more educational light. Our Office Manager, Monica, takes the reigns of this episode, calling on knowledge from her former life as a student of ancient history to guide us through the game. Joining her is Maxime Durand, Ubisoft’s Production Coordinator and Historical Researcher who is responsible for the historical accuracy of the series, along with Monica’s friend and former colleague Bethany Simpson Ph.D, a lecturer at UCLA who together with Monica helped to excavate Karanis, an archaeological site that is featured in the game. This is set to be the most educational edition of Devs Play yet, exploring a game mode that takes advantage of all the hard work that gets put into a building a game world of this scale, that often passes us by underappreciated. It’s exciting that something like this could ever see the light of day, and we are excited to explore it. Come and join us on a tour of ancient Egypt! If you like Piña Coladas and getting caught in hazardous industrial machinery then you should try the new and improved Gang Beats Online Matchmaking Services! Download the latest Gang Beasts update and let our freshly updated algorithms sort through the offal and off-cuts until they find you the ultimate match — Even over long distances. Get ready to thoroughly break some hearts, because we’ve also thrown in a fashionable selection of sentimental heart and love influenced costume parts, so you’ll look the part when you are swept off your feet into the path of an oncoming truck. 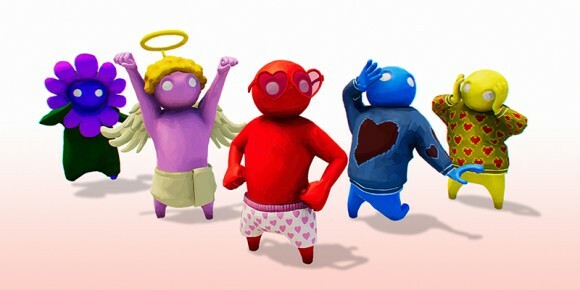 A full patchlist can be found on the Gang Beasts blog. Prepare to scream with horror and delight as gangs of saggy, pugnacious thugs from Beef City punch, kick and slapstick their way across your screen, hurling their foes into hazardous machinery or mercilessly head-butting them into flaming incinerator pits! 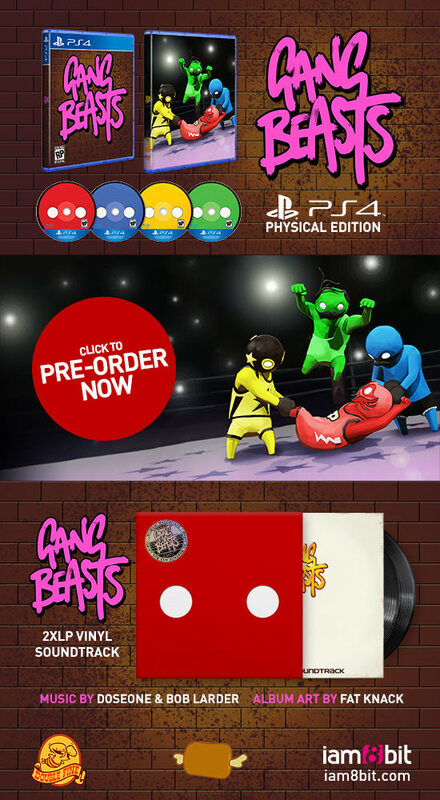 That’s right folks, the long awaited Beef-em-up Gang Beasts Gang Beasts is out now on PS4 and PC! Please join us for this special all-night streaming event and help us raise money to heal kids! 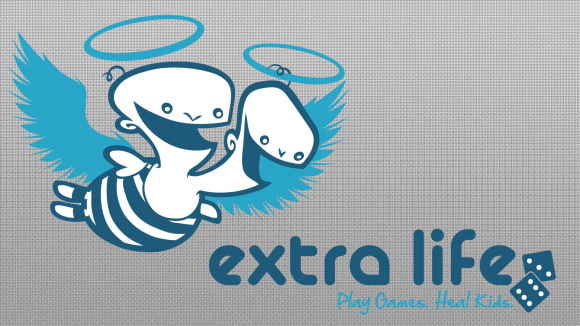 On Nov 4th the bravest and mightiest among us will be staying up all night, playing games for 24 hours straight to raise money for Children’s Miracle Network Hospitals in the Bay Area, and we’d love you to sponsor us! As it turns out it’s actually 25 hours, because daylight savings will kick in right in the middle of the night! We’ll be streaming the entire time from our studio in San Francisco, and invite you to watch us as we slowly deteriorate into jibbering wrecks as the sleep deprivation takes hold. We’re going to line up a whole series of interesting, weird, and silly games to play throughout the day and night, including a run-down of some of the unreleased indie titles that will be playable at Day of the Devs, and some of the crazier peripheral based games that we seem to have accumulated here. We also hope to have a couple of special guests pop by! 3am - The Horror, The Horror! 5am - I can SIIIIIINNNNNNGGGG! Come on down to Seattle this weekend and join us at PAX West for another weekend of games and pretty much nothing else! This year is all about Double Fine Presents, so you’ll be able to play Knights and Bikes, Ooblets, and GNOG on ios. We’ll also be hosting a Gang Beasts tournament, so show up Friday or Saturday morning to earn a place in the semi finals, and a chance to compete for the championship on Sunday! Our shop will be extra large this year to accommodate all the goodies we have, including a host of vinyl records, some new shirts (new whispering rock colors!) 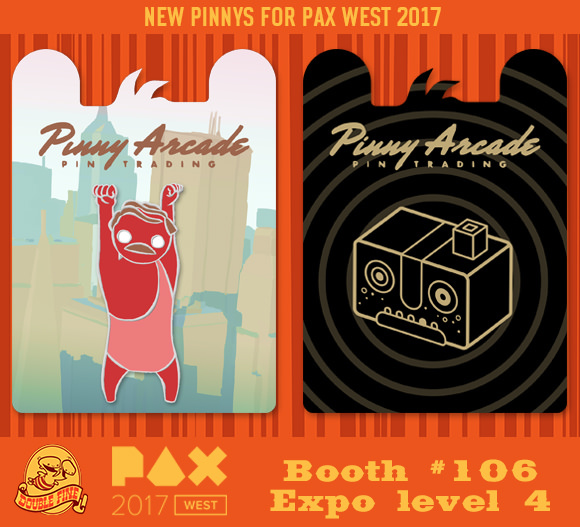 and of course our two new official PAX Pinnys. 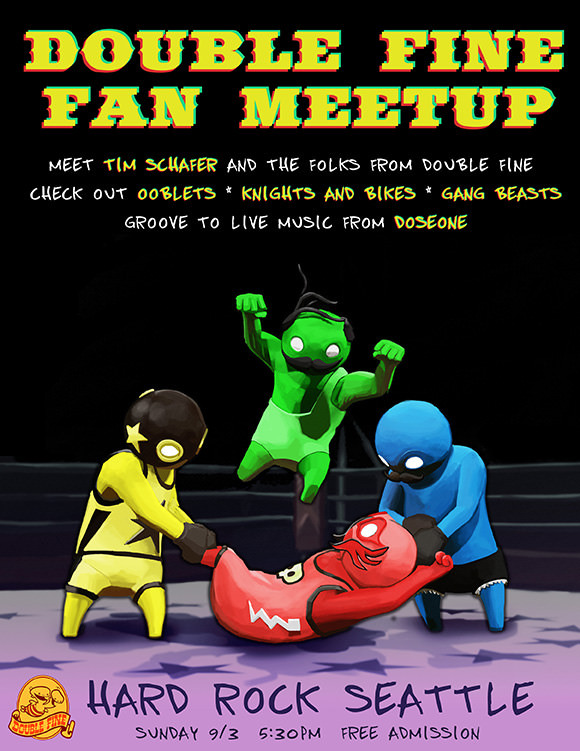 On sunday evening we’ll be hosting a fan meet in the usual spot - Hard Rock Seattle on Pike. It’s free admission, and no PAX pass is required, which means you have no excuse not to come! You can RSVP now on Facebook if you like. Hope to see you in Seattle this weekend folks! As is pretty much always the case, a new version of iOS for iphones and ipads will arrive soon. But this update comes with a frustrating slice of modernization: Once installed, iOS 11 will no longer allow you to launch 32-bit apps. Lots of our games and apps are still 32-bit, and so we face the dilemma of either updating them to be compatible with the new 64-bit iOS (which is more complicated than it sounds) or we lose them forever. We’re going to do our best to support our games and sail with them into this bright new 64-bit future, but unfortunately there’s not enough room on the lifeboat for everyone, and some of our apps are destined to sink into the briny depths of oblivion. These guys will be updated to work on iOS 11 and beyond. These guys will be stranded briefly on limbo island whilst we figure out how best to save them. Sadly these apps will not be updated for the new iOS. The Psychonauts Vault Viewer lives on in video form thanks to 2 Player Productions, see below! Alas, poor Costume Quest for iOS and Dropchord and The Cave will be no more. It’s worth noting that if you never upgrade to the new iOS then these three apps will go on working for that device, and should still appear on the app store for you too. The Vault Viewer is already free, but we will soon make Dropchord and Costume Quest games free too for anyone who chooses to remain in the past, and for everyone to be able to enjoy them in these final moments. The Cave’s future is uncertain, and is in SEGA’s hands, but it will not be updated. Here is the Psychonauts Vault Viewer Archive Edition, which features some exclusive Psychonauts commentary from Tim and Scott C.
The synth-filled Headlander soundtrack by David Earl is now available on Vinyl, in a limited edition from iam8bit. Watch the below to see all the love that went into making it, and order yours today!